Simple, eco-friendly solutions to improve any garden. I thought this would be a great time to dive into this topic because so many of us are chomping at the bit to get out into the garden. 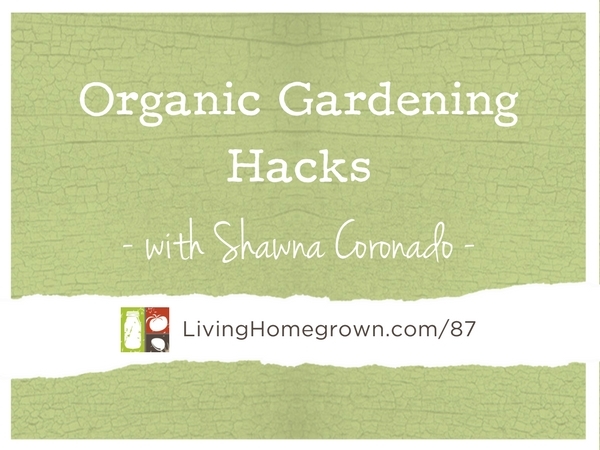 In this week’s episode, I bring on author Shawna Coronado to talk about organic gardening tips from her book, 101 Organic Gardening Hacks. Some of the tips are practical time-savers, others are clever ways to upcycle everyday items. But all of them can help you grow a more organic and eco-friendly garden. Shawna Coronado is a successful author, blogger, photographer and media host who focuses on green lifestyle living and organic gardening. Her garden, food and eco-adventures have been featured in many media venues including television news programming, radio broadcasting and PBS television. She has written numerous books including Grow a Living Wall and 101 Organic Garden Hacks. And she has another book coming out the end of 2017 called The Wellness Garden. Loved this episode. I will certainly check out her book. My favorite hack is to root the tomato suckers that you prune and then plant them. We have a long growing season and one of the master gardeners I know suggested this to lengthen the tomato producing season. I can’t see you speak is that the way it sopose to be? I can hear you but no Vedio.